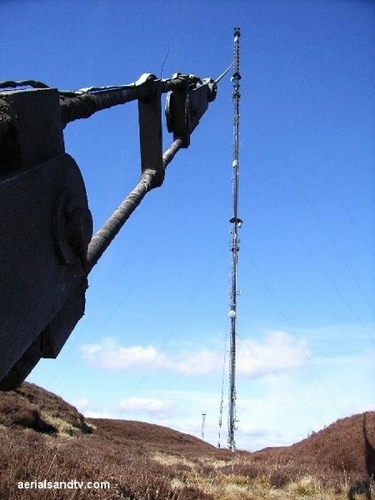 An overall view of Holme Moss radio transmitter. Note the helicopter being used to “re-seed” the moors in the area behind the TX. Holme Moss from the end of the highest “stay” anchor point. Base of Holme Moss radio transmitter. Note Emley Moor in the background. Now this is a view, well worth a trip up there. One can see over 50 miles, for example Drax power station is 40 miles away yet it is still visible on a clear day. Note Emley Moor transmitter which is just discernible in the distance. out 250kW of BBC National FM. In terms of population coverage (for the BBC national channels) its coverage is around 13.5 million (also see top 12 FM transmitters). Holme Moss also broadcasts DAB Radio at 5kW, BBC GMR (towards Manchester) at 5.6kW and Radio Sheffield FM (on 104.1MHz) at 4.4kW. Having said that, most people actually in Sheffield will get there FM Radio Sheffield from Crosspool on 88.6MHz. Contrary to popular belief, Holme Moss is not a TV transmitter and in fact has never been one for UHF. The latter system was introduced in the mid 60`s (1966 from Emley Moor, BBC2 only at that time) to replace the old 405 line VHF which was broadcast from this site until 1985 when the original mast was demolished, though I can`t imagine there were many people using it by then. Notice how the public were given over 20 years to change systems, rather more time than was allowed for the Digital switch over ! The first mast was built in 1951 to transmit BBC television (only one channel, BBC2 didn`t start till 1964) on VHF but when ITV started broadcasting they did so from the original Emley Moor tower in 1956. This duplicated transmitter system was also used at Sutton Coldfield/Lichfield, Crystal Palace/Croydon and Pontop Pike/Burnhope amongst others. The present transmitter was erected in 1984 and is a "guyed mast" structure which is 228m in height (see How High is High ?). That may not be as impressive as Belmont but combined with its elevated site, that gives Holme Moss an overall aerial height of 758m (a.g.l) above sea level. Unsurprisingly the latter figure is (probably) the highest in the country. 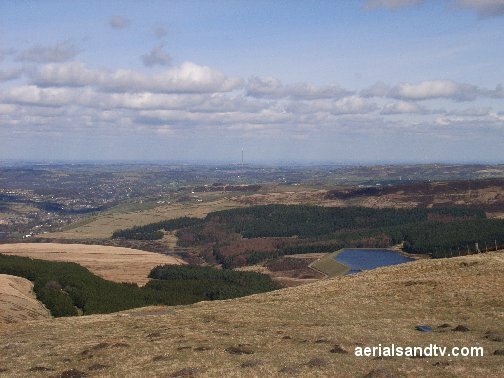 In fact such is the altitude of the site that the transmitter can actually be seen from both side of the Pennines, and there can`t be any others which can claim that. It is the aforementioned high ground which has made this area so important for RF (Radio Frequency) transmission and both Emley Moor and Moorside Edge are visible from the site. This exceptional transmission height was exploited in 1956 when some field strength tests were done from Holme Moss at 188MHz (VHF), the linked pdf makes interesting reading. 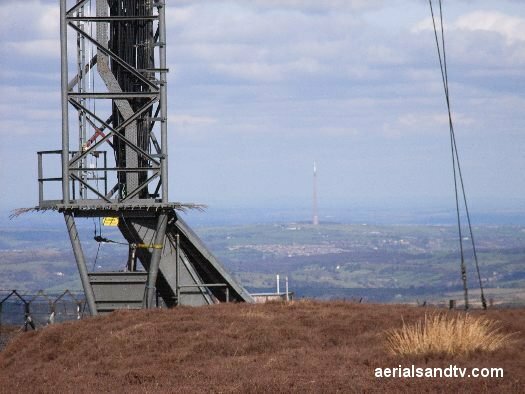 Another possibly unique aspect of the site, is that whilst the base of the mast is in West Yorkshire, the Derbyshire border is so close that the outer stay anchors (on the SW side) are in a different county ! Furthermore the South Yorkshire border is only one and three quarters of a mile away to the SE, the boundary into Oldham/Greater Manchester (Lancashire ?) is two and a quarter miles away (to the West) and that of Tameside/Greater Manchester (Cheshire ?) is five and a half miles away to the SW ! How many geographical points in the UK can claim so many counties as near neighbours ? The TX is situated about 10 miles SW of Huddersfield, near the course the old Woodhead tunnels. The latter was the first railway line from Sheffield to Manchester (of 1845) although the original tunnels were replaced by a new one when the route was electrified in 1954. Just like the old ones, the new tunnel was about 3 miles long. Six men died during it`s construction so it was all the more tragic that the line was closed only 27 years later, in 1981. The Pennine way also passes by within a mile or two. Since transmitters are usually on high ground the views from their locations tend to be excellent. Those from Holme Moss are absolutely superb and it`s worth a trip up there just to see them. The only other TX with comparable views is Winter Hill just NW of Bolton. A picture towards the East is reproduced below.